This walk: 2012-3-7. Kit Hill (Cornwall). Artefacts from the Bronze Age, from tin-streaming, tin-mining and from granite quarrying. Kit Hill Country Park was owned by the Duchy of Cornwall but was given to the people of Cornwall in 1985 to celebrate the birth of Prince William. It comprises 400 acres (152 hectares) for public enjoyment. The Kit Hill summit stack - part of the Kit Hill Great Consols/Kit Hill United mining complex, it was built in 1858. It served a steam engine that both pumped water and lifted ore. It was also joined by a flue that took away arsenic-rich fumes from a calciner. The stack is fitted with radio equipment for the emergency services. Trig. point at 333 metres (1092 feet). View to the east of Kit Hill, click the image for a larger version. View to the south, click the image for a larger version. View to the west, click the image for a larger version. Part of a pentangle earthwork on the to of the hill that is thought to be an 18th century folly. The summit stack stands on a bastion that is part of this structure, two other bastions can be seen in ther photograph, forming strong point in the enclosing wall of earth. It has also been thought to be an ancient stronghold, commanding a crossing place of the River Tamar. It may also have been a religious site in prehistoric times because there are at least 18 burial mounds on/around the hill. Remains of Engine house for Kit Hill United (Summit Mine). Fly Wheel loading slot for same engine. Part of the collapsed flue taking arsenic fumes from a calciner to the stack (calcination is the heating of ores to melt and extract metals). Kerb stones that surrounded the edge of the barrow. Shaft relating to the nearby whim-platform. Looking west towards Kelly Bray, viewing one of the three "donkey pounds" or more likely John Calls' follies (as at the summit). A second quarry, now left as a nature reserve. View across the wild quarry to the entrance area of the first quarry (see above). Rock face inside the second quarry. Kit Hill Quarry notice - click the image for a larger version. The main inclined plain for lowering stone to the railway system. The nearby, still-working Hingston Down granite quarry. This is a stack taking arsenic fumes from Wheal Martha down in valley below, up and away from Luckett village. Strollers imitating The Borrowers, beside the wall retaining waste from the earlier inclined plane. The earlier, smaller, inclined plane for transporting granite from the quarries. Possible explosives store, or a counting / quarry office building. The first, uppermost water reservoir of the Medieval tin-streaming works. Looking vaguely towards the Hingston Down area, where the Saxons beat the Cornish allied with the Danes (i.e. the Vikings) in 835 (or 838), bringing an end to Cornish independence. An abandoned stone, an excellent example of splitting by wooden wedges - these were inserted into the cut grooves and soaked with water to expand the wood and split the rock. An abandoned apple crusher that was being made using the wooden wedge method. Welcome to Kit Hill notice - click image for a larger version. Entrance to No 1 Level for WW1 Wolfram Mine. The boat shape up by the finger dumps was an area for a cable tramway to operate, lowering trucks of ore down the slope (WW1 wolfram mine). Eventually, the ore was taken under the road and then by Blondin across to Clitters Mine for processing. South mine at Kit Hill, with an unexplained building in the foreground. Modern drilling marks from splitting the granite, not feather and tare marks. Close-up of a way marker, depicting the summit stack. General scene at the South Mine. South Mine notice - click image for a larger version. Setting off to see the six buddles in the area. In the foreground is the balance bob pit that kept tension on a system of flat rods that ran up the hill to the mine shaft where an angle bob turned 90� down into the shaft. A steam engine turned a crank the pulled the rods downhill to give a lifting action in the shaft, the flat rods then "fell" uphill as the weight of the pump rods in the mine shaft took effect as the driving wheel of the steam engine rotated. 62. Showing the proximity of the summit stack (at left) to the south mine. Saying "Thank you" to John and Elaine. MAP: Red = GPS satellite track of the walk. 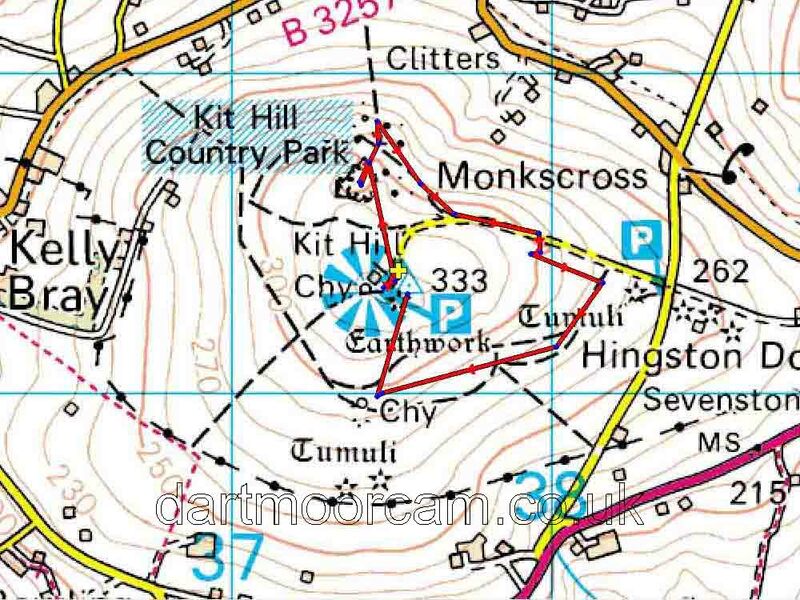 This walk was reached by driving to Callington from Plymouth, turning right at the first roundabout, bearing right at the second roundabout, going through a crossroads, then bearing left and finally turning left at a brown tourist sign for "Kit Hill". There are several parking areas including at the summit. We parked at the summit, marked by the yellow cross.